Printed Mugs for your Business' Branding in UK - Mug Business Ltd. The Trusted National Supplier in UK to Trade and Retail for Printed, Corporate and Promotional Mugs. With no minimum orders we guarantee our mugs and guarantee your satisfaction. Learn more... or Get a quote now! Promotional Printed Mugs, Corporate Business Printed Mugs​, Charitable Fund Raising Mugs​, School Mugs​, Special Event Mugs​, Coffee Mugs, Printed Mugs for Retail or Quality Gift Shops. We manufacture Promotional and Corporate totally customisable full colour printed mugs. We supply free realistic PDF of what you mugs will actually look like before we manufacture and then we provide a free real life sample so you can be totally confidant of what your going to buy. If required we can then change design until your all totally happy and we do all this free of charge. We also supply to the mug trade who retail our mugs to the general public and some high street chains/shops. Our mainstay business is supplying Corporate Promotional Business printed mugs only. By dealing directly with us, you're cutting out the middle chain, guaranteeing you the best prices and quality as your buying directly from the mug manufacturer for your printed/promotional mugs and therefore saving money and being assured your mugs are of the of the highest of quality. ​Whatever your requirements ​Mugbusiness.com ​is committed to helping you as much as we can. ​Our mainstay business is supplying Corporate Promotional Business Printed mugs. However, we also supply many varied customers across the whole of the U.K. We only use high quality mugs that are guaranteed to 2000 dishwashes without fading and inks up to European standards. ​We won't be beaten on price and the price we give you won't change. You won't incur any set up costs or charges for additional colours. We are a small , experienced team that will give dedicated service when you need it. Call us when it suits you rather than Call Centre hours of service. Our mugs speak for themselves. Have a look at our gallery and see for yourself. We are genuinely proud of the mugs we produce. We won't manufacture your mug until you are completely happy and you can make as many changes as you require to get your desired outcome. We manufacture to the highest specifications and supply a variety of mugs to customers who retail in High Street outlets/chains. With Free Mug Design, Free Mug Previews and​ Free Samples​,​ plus the confidence to see who already uses us​, we hope you will get in touch. We will give you a​n​ instant quote with no obligation and you can take it from there. Special offers on all Promotional Durham Mugs, School Fundraising Mugs and Cambridge Mugs full color Printed with no hidden extras and free unlimited colors. We only supply fully Dishwasher tested Mugs either Double Orca coated or 2000 dishwasher coated Duraglaze coated mugs tested to not fade for up to 2000 dishwashers. We also offer a price promise that we will beat any genuine price for the same Dishwasher tested quality mugs and that includes our free mug design and previews service. Our Duraglaze mugs have been tested up to 2000 dishwashings without fading so you can be confident of price and quality. 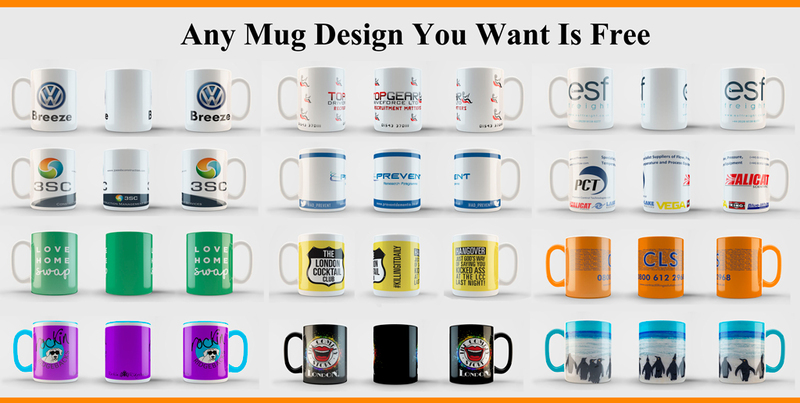 There is no risk as we will provide you a free real life finished sample before purchasing of your printed mugs and we pay for the postage and the mug as we are confident of our mugs and our prices. Our Duraglaze® coated mugs are the only truly 100% dishwasher proof Mugs in Europe. They have been independently tested to over 2000 washes. Duraglaze® is a trade mark for listerwood and they say that they will out perform any other sublimation mug on the market offering exceptional value for money and will result in you being a totally happy satisfied customer. Duraglaze® coated Durham mugs are also now available in both 10 oz and 11 oz at no extra cost for either size that suits. Also all our Cambridge mugs and Sparta printed mugs are also coated with the indpendantly tested Duraglaze® coating. We love Duraglaze® and now even our new full colour mugs and our colour rim and handle mugs also now have the Duraglaze® coating this ensure no worries about longevity of your printed mugs and we think the best on the europen mug market. Look Who uses Mugbusiness ! Why You Should Use Mugbusiness Its Quite Simple !! We know that you have to see an accurate example of what your mug will look like before purchase. Only after seeing how it looks using exact 3D images can you make changes. To be sure it is exactly as you would like and envisage. After that its down to us to manufacture your free sample. It is critical to us to give you what you want and only after seeing your actual mug can you make a informed decision based on the sample. We also believe its important for you to make unlimited changes as things evolve after seeing a sample. We don't take any chances when we manufacture and we will not supply without you being totally confidant with your sample, you can fully asses the quality of the product yourself as we are confidant you will be happy. We use 50% more ink when we print and we use the best sublimation mugs we can purchase all have been tested to rigorous standards and we buy from a supplier we can trust .Who in turn buys from a manufacturer who supply's consistent quality. So if you want to be confident of getting a great design exactly the way you want it on your mugs and also be totally confidant of what's its going to actually look like before ordering or manufacture then contact us. Best Quality Mugs and - Fully Dishwasher Tested Mugs - and at the Cheapest Prices Guaranteed. Long-term, consistent advertising & branding pays off. In an ideal world, do you want to get your advertising message to your customer 8+ times a day, everyday? Is there a way your message can constantly be there at the right time, enabling your customer to make the right decision? It's not cost effective to be advertising to a audience that may or may not be interested in your products. They say your customer makes their most valuable purchasing decisions when most relaxed. Selling your concept is all about the multiple decisions your customer makes about your company before they respond. When reading a press/paper advertisment, is your customer going to remember your brand when surrounded by competition. Why should your customer remember you? Repeated on-going customer advertising/branding can just be prohibitive from a cost point of view. We don't sell anything else beside mugs, the reason being we don't believe there is any other product on the market that if designed properly can achieve consistency, giving you the best chance statistically of getting your successful message to your customer. Not all mugs are the same. Our entry level printed-only spot colour mugs are most cost effective when you only need 2-4 spot colours. Our full colour, sublimated mugs we manufacture have thousand of colours and are usually supplied where it's important where they may be resold, or have more perceived value to the end user. Carrying a fully branded, high res picture assists greatly in getting your full message over to the client repeatedly. They are produced where a picture/artwork is agreed before hand and baked in a oven at apx 200 degrees. There are number of hard wearing coatings on the market for sublimation some are guaranteed for dish washer cycles and microwave safe and some cheaper mugs on the market unfortunately are not tested and anybody can make inaccurate claims about there mugs. Using a dishwasher is a variable quantity e.g. temperature settings, number of cycles, and the chemicals used, and all will have a bearing on durability and longevity of your mug. So its important to get the best out of you mugs and we will discuss your specific application and use in depth before purchase. You can choose from our dishwasher and microwave safe tested mugs that have been tested from 50 hrs continues cycles not to fade mugs to our specially coated dishwasher and microwave to tested mugs that have been tested not to fade for in excess of 2000 dishwasher cycles. We only supply mugs that have been tested for durability and safe microwave/ dishwasher use. We work with your design to get the best for you and your customer, and guarantee our products. Who benefits from mug advertising & branding: You, the client, or you both? As a company it's important to keep your hard won clients happy. Most ongoing businesses have a loyal customer base that is important to the short and long term aspirations of the company. By giving a promotional/corporate mug to your client, you're keeping them happy and going the extra mile in getting your message over to them in a constant yet friendly manner when it counts. What's critically important is for it not to be put on the top shelf but used hourly, daily and weekly but trying to achieve this is not always easy. It's important to us to discuss how to meet this goal and put the statistics on your side, in turn relating to your most cost effective method of advertising/marketing. We are a small business and as such offer you a Fully Personalised Service every step of the way. You can contact us evenings and weekends as necessary as sorting Great Designs out is a full time occupation. We offer Free Full Mug Design and technical support. We can either use your copy/logos or provide you with a number of design options FOC. Your Free Mug Previews are usually sent within 24 hours. Unlimited Changes to your copy until you are totally happy with the design. Free Sample provided to your workplace to enable you to see the finished product before you buy. We also offer the opportunity to Amend The Design if the sample doesn't turn out as you envisaged. We'll simply amend your final order and get it Spot On before manufacture. We will be as Flexible as possible regarding your Delivery Time frame. We specialise in Time Critical projects and can usually meet Urgent deadlines. Deliveries are Fully Insured and tracked using overnight couriers.Various delivery options are available. Full after care service. Any mug breakages will be Immediately Replaced FOC. Full Colour Wraps and coloured handles, rims and inners are also available and our mugs are sold through a number of specialist retail outlets. We can, if requested, Personalise Individual Mugs that are part of any Larger Corporate Orders. We have been overly impressed with the service and quality of product received from Mugbusiness. John really exceeded our expectations with his care and attention to detail with our order. We wholeheartedly recommend Mugbusiness. John turned around a very small project (which was time critical) for us at extremely short notice. He treated us as though we were his most important client and genuinely wanted to help us out. He went way beyond the call of duty in making sure that the promotional mugs were exactly as we wanted and delivered on time. I cannot recommend mugbusiness highly enough! Thanks to John and the team for the mugs! We would definitely recommend Mug Business! Fast, affordable and great customer service! We will definitely be reordering in the future! By Using our website and our Services you agree to our Terms and Conditions. We reserve the right to change Terms and Conditions giving no notice at any time. We are committed to supplying great service with FREE DESIGN and FREE SAMPLE with no minimum order. We are commited to supplying great service with FREE DESIGN and FREE SAMPLE with no minimum order. Fast Quote within 1 hour, 24/7.